Treats are an important part of training. They work to reinforce behaviors we would like our dogs to do more of. Treats also work to create positive associations with new items, like truck backfires or men in hats. In other words, treats help us teach our dogs to do more of what we like and help us make our dogs braver. If your dog learns that wearing his muzzle = “favorite treat,” then wearing a muzzle will become a favorite activity. So which treat is the best for use with a muzzle? Learn all about how to teach your dog to wear a muzzle in our Muzzle 101 video here. 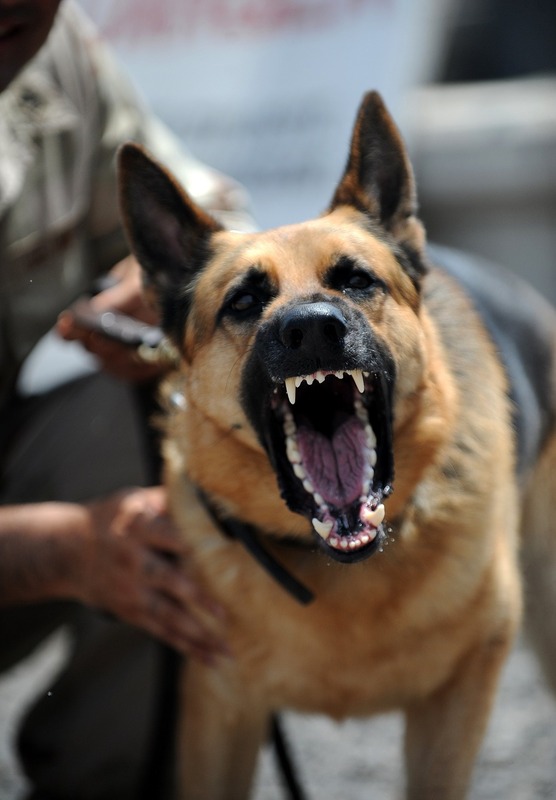 There are many reasons why we may choose to muzzle train our dogs. 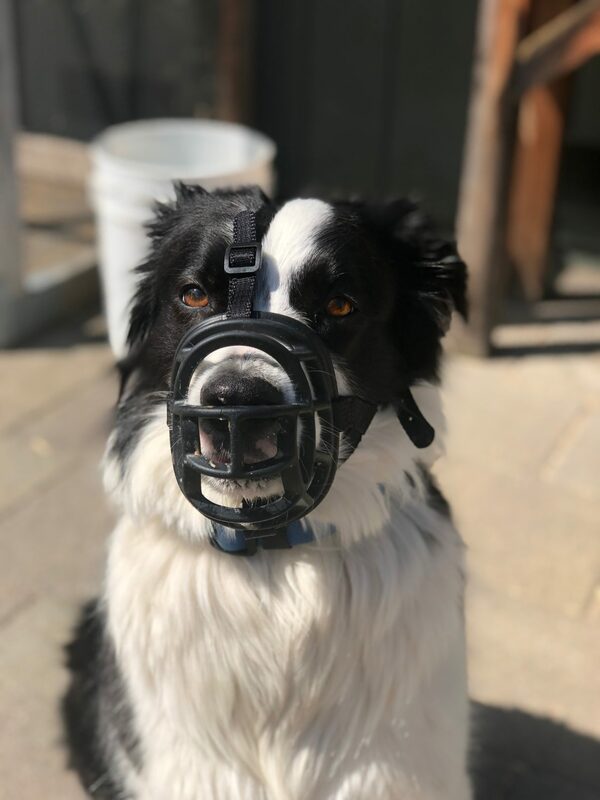 Muzzles can be a helpful tool to keep everyone safe while working with a reactive or fearful dog, a dog with a potential for aggressive reactions, or for use while improving social skills. I have also used muzzles as a preventative tool for dogs who have a tendency to eat things on the ground that could be potentially harmful – like rocks or rancid food. Moreover, by using a muzzle, you can make a stressful situation into a positive, successful learning experience. Above all, muzzles are a management and safety tool. Regardless of whether your dog has a low bite threshold——a dog who is more reactive in stressful or fearful situations——or your dog is more tolerant in stressful circumstances, conditioning your dog to wear a muzzle can be an important skill for everyone. In fact, my own dog is muzzle trained just in case we need it at the vet’s office if he’s in pain. Any dog can learn to wear a muzzle. When the muzzle is introduced and trained properly, many dogs can benefit from it! It is important to keep in mind that when using a muzzle for training, that not all types are appropriate. A basket style muzzle is the most ideal design, as it allows your dog to eat, drink and pant with ease. Our article on The Six Best Muzzles for Tough to Fit Dogs is a great place to start when looking for the right type and fit for your dog. Importantly, a basket muzzle allows your dog to take treats. Treats are a crucial component to training and behavior modification. Well-timed treats reward behaviors we want our dogs to repeat and aid in changing a fearful or anxious emotional response to one that is more positive. What Makes A Good Treat for a Dog Wearing a Muzzle? When shopping for a muzzle, keep in mind your dogs’ head shape, length, and width. Not all dogs are built the same. Soft. Soft treats make chewing easy and fast. If a treat is hard or crumbles, your dog might have a hard time eating it all in one bite. If the treat is too chewy, it might take them too long to finish. High Value. Muzzle time should equal a delicious and valuable reward. This should be something above and beyond what you offer as a reward for sitting on cue in your living room! Small. Remember, it is quality (high value), not quantity that matters when training. Make sure the treats are small enough to fit through the bars of the muzzle and are easily chewable sizes. Lickable. Peanut butter, cream cheese, etc., are fabulous choices when teaching your dog to love putting their nose into the muzzle – especially when we first introduce the muzzle. These spreadable treats are high value, and easy to apply to the inside of the muzzle. Some of the most motivating treats for your dog are easily accessible and relatively inexpensive. You might even have some of these items in your fridge! Hot dogs Yup! Hot dogs are cheap, can be cut into whatever size bites that suit your needs, and are high value. They have a high salt content. These are great for use when a very high value treat is needed for short training sessions. Whipped cream in a spray can This is a delicious high value option, and is easy to deliver. This is not a healthy option, but it is highly motivating. Great in small doses. Chicken Flavored Baby Food High value, easily accessible, easy to consume. Comes in a squeeze tube. Too much can be hard for your dog to digest. Save for those training sessions where you need something special. Squeeze Cheese Easy to control the amount you are giving. Easy and quick to deliver. Most dogs love it! Not the healthiest option out there. It can also get messy! Meat (Turkey, Beef, Steak, Chicken) Healthy in moderation. Some may not hold as much value as some other treats. Can be costly and requires more preparation time. Check with your butcher for good prices on leftover scraps! Peanut Butter It is ideal for training your dog to put their nose into the muzzle, especially in the initial training phase. It can also last longer than some alternatives. It is also great to hands-free treat delivery. Spread on the item and let them lick away! Can be messy, and in some situations, you may need something with a quick delivery and quick consumption rate to increase the rate of reinforcement. Cream/Spreadable Cheese Similar to peanut butter, in the length of time it lasts and the ease of delivery. It is also good to add variety to your rewards. Canned Dog Food Easily delivered if put into a large syringe or squeeze bottle. Mix with water to make it more liquified. Empty travel-size shampoo bottles make a great delivery system. Depending on the type and brand of food, it might not be as high value of some other treat options. Canned food can be messy. Benny Bully’s. Dogs love ‘em, and they are easily broken into tiny, easy to consume pieces. Pieces are flat and easily fit through the bars of the muzzle. They have a strong odor (though this is great for dogs)! Some pieces can crumble easily. Freeze Dried Cheese Again, high value and easy to consume. Pricy and crumbles easily. Delivering treats through the bars of the muzzle can be a little more challenging – especially if your dog might bite. Keep your fingers safe! If your dog is nervous or anxious, you might find they have a less bite inhibition than they normally do (meaning a nervous dog is more of a bite risk). Consider using larger treats that make it easier for your dog to take the treat gently. Trainer’s Tip: Squeeze bottles and syringes are a fantastic way to deliver wet treats, such as yogurt, spreadable cheese, applesauce, canned food or peanut butter. The best part is, you can rotate through different treat options and control the amount they are receiving. This method also keeps your fingers safe and makes rewarding your dog easy and fast. If you’re a bit lost on how to give treats to a dog wearing a muzzle, check out the how-to video below! It is important to keep in mind that motivation is a key component to success, so consider what might be high value for your dog. Generally, if it is stinky, sticky, and generally unappetizing to you, it is likely more appetizing to your dog. I also like to vary the reward, so it doesn’t become repetitive or predictable. Did we miss your favorite treat? What is your dog’s favorite easy-to-deliver reward when training with a muzzle? Remember, muzzle training can be a positive and fun experience for you and your dog. Please share this article with all of your friends and family and check out the Muzzle Up! project for more information on the importance of muzzle training your dog. Thank you for this blog and video! I recently started muzzling my 12 month old shepherd/husky rescue dog because he has developed a low bite threshold with fear and he is very fearful of many things. He does not like the muzzle but tolerates it because I give him treats through it, but I will definitely try peanut butter and cheese spread! I also like that you encourage muzzle training, because I often feel like people are judging me or afraid of my dog when they see the muzzle. 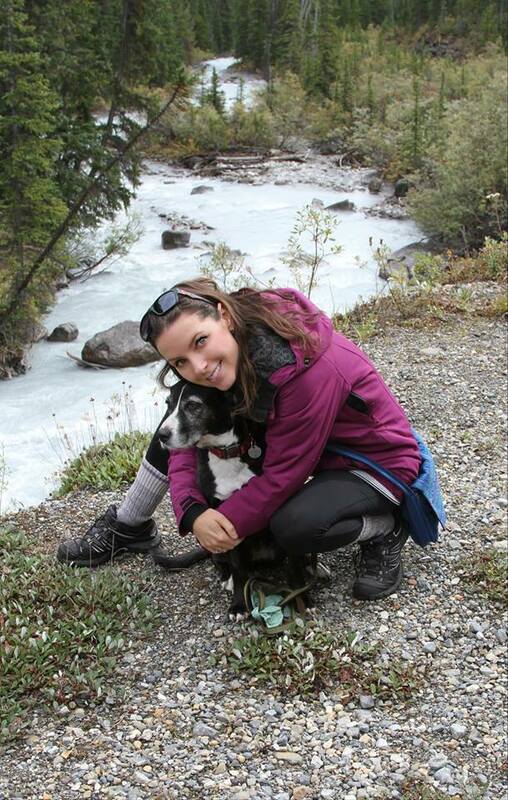 I now have a personal trainer and behavioralist, but I love reading your blog as well!